Before 1700, most of the settlers in Salem, Cumberland, and Cape May counties worshipped as Quakers, Baptists or Presbyterians. By 1775, the South Jersey area was dominated more or less equitably by congregations of Presbyterians, Baptists, and Friends, in addition to a small number of Methodists and Lutherans. By 1860 Methodism abounded, followed by smaller numbers of Baptists, Presbyterians, and Friends; and by 1890, Methodists far outnumbered all other sects. This pattern of religious development is reflected in the extant churches. The religious buildings here fall into three groups: Quaker meeting houses, gable-front Greek Revival forms with and without gable-end spires, and irregular-plan Victorian compositions with towers and wings. The oldest structures in the New Jersey Coastal Heritage Trail area reflect the first two; most rural examples are frame, while the Quaker and urban structures are typically brick. The Quakers appear to have been the most influential in the seventeenth century along the shores of the Delaware River, where they are attributed with founding Salem, Penns Neck, and Greenwich. Eventually some, like Richard Hancock, left the waterside environs for interior towns that were more typically settled by Baptists or Presbyterians. Figure 107. 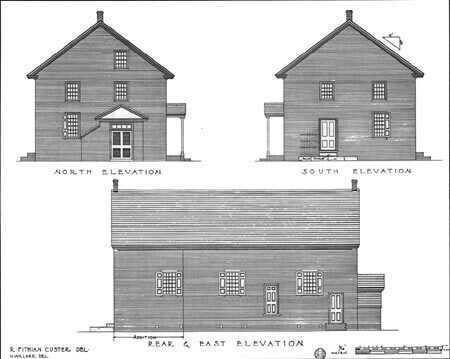 Old Friends Meeting House (1779, HABS No. NJ-105). Two bays by five bays, the front facade is Flemish bond. Separate entries and interior seating are provided for men and women. Associated with many meeting houses are Friends cemeteries, noteworthy because until the late eighteenth century Quakers believed gravestones should be proper and simpleor without markings. Two exemplary sites are near the Greenwich and Salem meeting houses, where they are surrounded by stone walls. The Greenwich cemetery has no markers, but Salem's does because it contains late eighteenth-century burials; thus, part of the latter cemetery mistakenly appears vacant. Some historic Quaker-built homes in Salem County may contain an alleged "secret room" once used to hide runaway slavesa difficult claim to prove because of the intentional lack of evidence. One such site is the Abbott Tide-Mill Farm outside Salem. The 1845 Federal-style mansion features an old, underground cistern accessed by a crude trap door that had long been hidden beneath contemporary cabinetry. The Abbotts, a Quaker family, support the oral history tradition of this "room's" use through abundant written documentationfamily papers, maps, and other recordsthough additional research is required to ascertain whether or not there is evidence for the claim. The first Baptist church was established in Salem County in 1683 by David Sheppard, Thomas Abbott, William Button, Obadiah Holmes, and John Cornelius. Thomas Killingsworth served as the first preacher, as well as an early judge in Salem County. 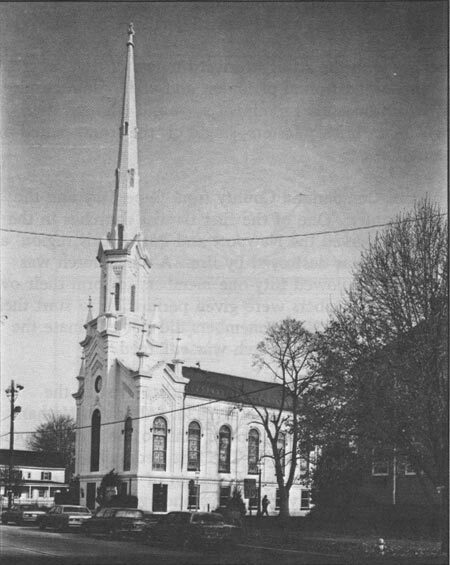 In 1690 these men built a frame Cohansey Baptist Church; a second building was erected in 1741, and in 1801 the congregation moved to Roadstown where the present Cohansey Baptist Church (Fig. 108) was erected. Figure 108. Cohansey Baptist Church (NJ-463) is highlighted by frame pediments and pedimented Georgian doorways such as this, plus round-arched windows with nine-over-nine-lights. The Shiloh Baptist Church, in keeping with the straightforward tenets of that faith, is reserved and well proportioned, with an unadorned frontal pediment and wide, plain cornice. 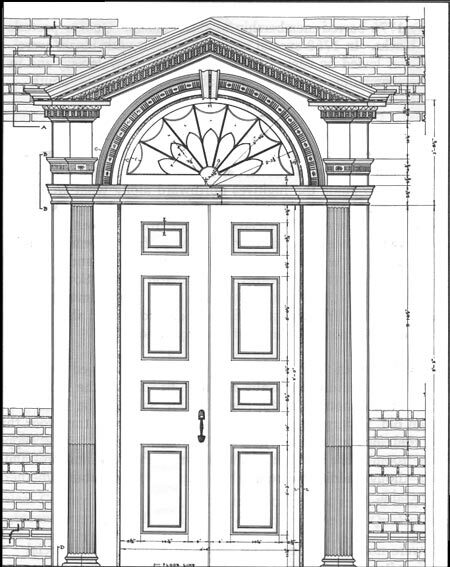 Tall, narrow sash flank the central door, which boasts a prominent surround (though the doors themselves are contemporary glass). Plain brick pilasterssingle on the front, paired on the sidespunctuate the tall, paired fenestration. The first Presbyterian Church built in Salem proper was in place in 1821 thanks to Robert Gibbon Johnson and other Presbyterians, after they were denied permission to share the Episcopalian church. The First Presbyterian Church (Fig. 109) in Salem is one of the most exuberant in the region. It was designed by Philadelphia architect John McArthur Jr. (1823-90), who served as chief architect of Philadelphia City Hall in 1869, as well as the designer of numerous residences, churches, and commercial buildings. The main facade features a series of recessed walls and borders. The verticality of the building is enhanced by its tall, round arched windows, decorative blind arcading, and dramatic 165' spire. It represents eclectic inspiration from several late nineteenth-century movements, especially Romanesque Revival. Figure 109. First Presbyterian Church (1856) facade has a projected entrance with a series of recessed facade and cornice lines, decorated steeple base and matching narthex-end walls. Bridgeton did not have a Presbyterian church until 1791, when Quaker Mark Miller donated a lot to the city for the purpose of building one with a burial ground. 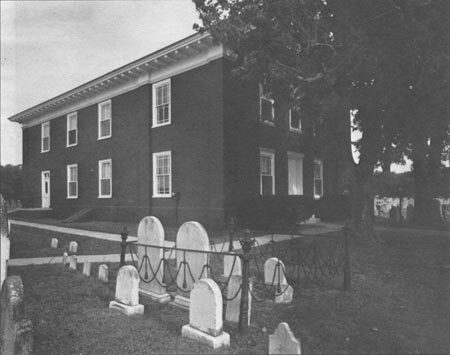 Broad Street Presbyterian Church, 1792-95, is the oldest of this denomination in the region, and its cemetery contains the graves of Cumberland County men who died in the Civil War. Located in an elevated urban setting also accompanied by a spacious, tree-filled burial ground, the area serves a parklike function. In Cape May County, the Presbyterians were organized in 1714 at Cold Spring. Similarly, services were held in private homes until 1718 when the congregation erected a small log cabin church. The adjacent cemetery, along with the original cemetery at Stone Presbyterian in Fairfield Township, contain some of the oldest grave markers in the area; many at Cold Spring commemorate men who lost their lives at sea. The present Cold Spring Presbyterian Church (1823, Fig. 110) is two-story, brick gable front with little ornamentation. One of the most interesting features of this site is the ironwork found in the adjacent cemetery, which contains the plots of noteworthy local citizens whose prosperity is reflected in the accoutrements of the iron fencingespecially faces, figures, and urns (Fig. 111). Figure 110. Cold Spring Presbyterian Church (1823, NJ-270). Two-story brick, with cornice and pediment with dentils. Three bays wide by four bays deep. Figure 111. 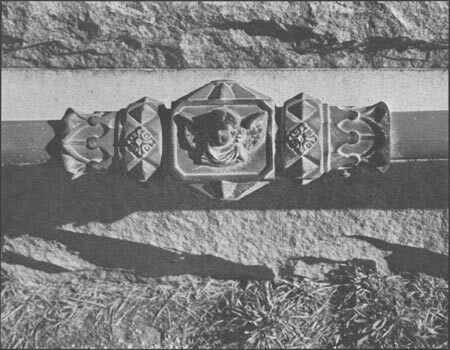 Ironwork, Cold Spring Presbyterian Cemetery, includes this Victorian cherub-face railing draped urn, willow tree, reaper figure, and swag-with-tassel.